Whether you are stick, MIG or TIG welding, working outdoors, indoors, or in confined space we have the protection you need. Welding protective clothing is manufactured using either leather or flame retarded cotton materials. For lighter welding protection or where high temperatures and or humidity are workplace hazard Proban garments are ideal. Proban welding apparel excel in the crucial areas of flame resistance, thermal protection, comfort and durability. 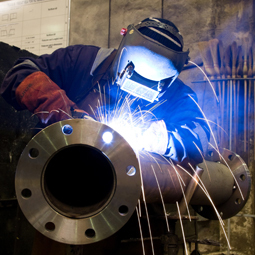 Elliotts Proban Welding Apparel is manufactured using Proban and WAKATAC Proban. Proban is a flame retardant solution that provides peace of mind to both industrial and consumer markets. Developed to give cotton and cotton rich fabrics reliable flame retardant properties that meet industry fire regulations. PROBAN fabrics are durable to modern day conditions. For lighter welding protection or where high temperatures and or humidity are a workplace hazard Flame Resistant (FR) cotton garments are ideal. Elliott FR Cotton welding clothing excels in the crucial areas of flame resistance, thermal protection, comfort and durability. Elliott FR Cotton Welding Apparel is manufactured treated FR Cotton. The WAKATAC, BLUE MAX and Hi-VIS welding apparel ranges include jackets where we combine the FR Cotton and leather. We utilise the leather in the sleeves, which is the area that normally wears our first. It is a winning combination of performance and comfort. WAKATAC Welding Apparel is the leading brand of FR Cotton Welding Apparel. The Wakatac Proban Apparel is constructed using premium 320gsm Proban which is 100% Cotton treated with Proban to offers a cool comfortable, 100% FR product ideal for medium duty welding. The range of WAKATAC Welding Apparel includes, jackets, jackets with leather sleeves, jackets with safety harness access point, hoods, sleeves and trousers. Blue Max is constructed using the Elliotts Blue 320gsm FR treated cotton. The Blue Max cotton offers a cool comfortable, 100% FR product ideal for medium duty welding. The range of welding Apparel includes hoods and neck flaps and the BLUE MAX range includes jackets and hoods. The Orange Proban® High Visibility range is made from 320gsm Proban® a flame resistance 100% cotton treated with Proban®.Proban® welding apparel is cool, comfortable, 100% flame resistant and ideal for medium duty welding applications. Elliotts have lead the way in protective clothing for welders, we have been at it for nearly 40 years. Elliotts offers an extensive range of welding garments made from various materials to take care of welders in all kinds of situations. Our welding range includes welding jackets, coats, trousers, sleeves, hoods, knee pads, leggings and spats made from all kinds of leathers and FR Cottons or combinations of both.